Anna von Hausswolff, The Dome, London. Anna Von Hausswolff took to the stage of The Dome last week, Getintothis’ Gareth Dorrian was there to see the Swedish songwriter in action. 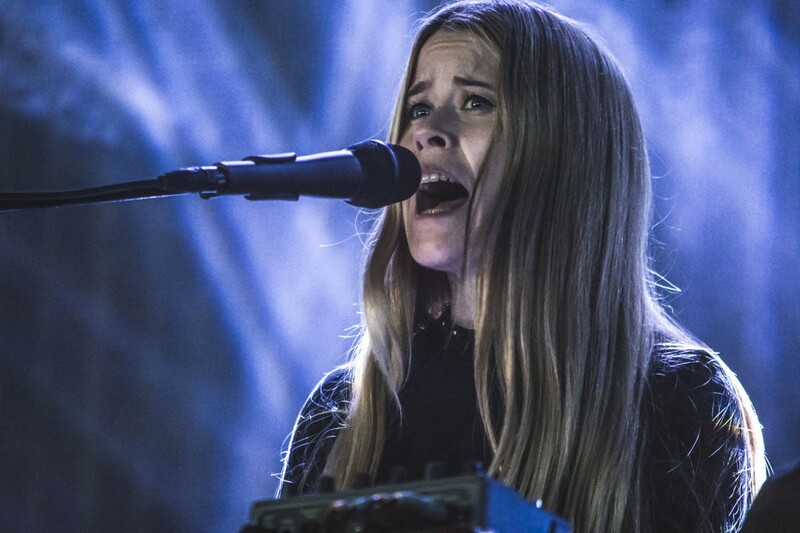 There’s a phrase in Swedish that sums up the music and onstage presence of Gothenburg singer, pianist and organist Anna von Hausswolff. “Liten men naggande god”, meaning small is good, captures some sense of tonight’s incredible show. As her tiny figure steps out of the darkness to climb behind an epic pipe organ, the ethereal sense of looming collapse becomes momentarily quite real when a faulty bass pedal postpones the beginning of a track. “Sorry”, she calls out in a cheerful, slightly miffed voice. “This is what happens when you let people mess with your stuff.” The crowd at The Dome cheer, and she laughs. Fault fixed, she launches into The Truth, The Glow, The Fall, the opening song on her fourth earth-shattering album Dead Water. And we’re back in dreamland. This stupendous three-part, 12-minute gloomfest is elegant and frightening. “Can you hear the song? It haunts you”, Anna pleads. A legion of transfixed fans nod. Tonight, her voice, a magic-infused wail that’s every bit as godly as her pipe organ, has surely never been in better nick. It soars and towers tonight like a benevolent bird of prey. It’s the most incredible sound you’re likely to hear in this lifetime and the next. The three-part song concludes with a sense of falling, as her vocal apparently careers down into a bottomless pit – the fatalistic rattle matched by cosmic synths, a solitary piano chord and visceral guitars. The ecstatic crowd barely has time to draw breath as she launches into dreamy instrumental The Marble Eye, which, much like her entire canon, sounds like hold music for heaven. Throughout the show, Anna leaps around, her plaits attacking the organ keys like animated drumsticks. Hair covers her face too as stark lighting illuminates her kinetic frame. But there’s another hiccup (one of only two) near the end when Anna attempts to play the medieval western that is The Mysterious Vanishing of Electra. Her guitar lead hasn’t been plugged in properly, meaning another moment of mild dismay before the show continues. But she’s charming and humble throughout, reacting to each shouted request with the same reply “I can’t remember how to play that”. She takes time to thank her band and growing army of fans between songs, who she toasts with a can of strong lager held high. The half-litre tin looks comedically large in her wee hand but it takes nothing away from the queen-like hold she has over tonight’s transfixed, packed venue. Anna ends the gig with gorgeous ballad Gösta, a reflective and beautiful song which she descends into the audience to sing. She moves through the crowd, holding the mic, making careful eye contact with any woman she can find. It’s an unforgettable moment at an unforgettable show, perfectly contrasting her doom-laden, dark epics with a personal touch. Small and incredible she may be. But her impact tonight? Immeasurably huge.